You can now reference any standard or custom field in custom worksheet equations — so you can perform powerful data analysis using data from anywhere in your account. Custom worksheets are available for customers on our Enterprise+ plan. This plan is ideal for complex organizations that demand the most sophisticated capabilities and a hands-on level of support from our concierge team. It also includes advanced security and backup features, as well as ongoing training services. If your product and marketing teams were already using custom worksheets, then you know that previously you could only include custom worksheet fields in your calculations. Some of you told us that it would be helpful to reference data from anywhere in Aha! in your worksheets, so you can answer complex business questions. Now you can. The syntax for referencing Aha! fields in custom worksheet equations can be complex. Which is why we created a detailed support article that explains exactly how this functionality works and provides some sample equations for common use cases. But if you need more help getting started or want to upgrade to the Enterprise+ plan, just reach out to our Customer Success team. We would be glad to help you get the most out of this advanced functionality. Note that you must be a customization administrator to create custom worksheet fields and add equations. 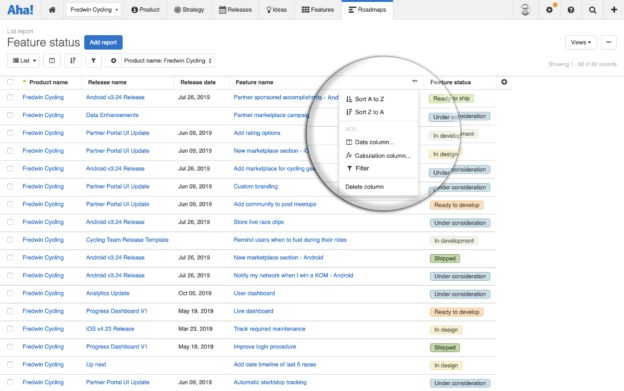 Product and marketing owners and contributors can enter data in worksheet fields, while all users can view the data. You want to find the highest priority features based on customer demand and strategic fit, right? In the example below, we created a custom worksheet equation that references two existing fields in Aha! — vote count and feature score. Multiplying these fields provides a total prioritization score to better inform your roadmap decisions. The total prioritization value automatically updates if the vote count or feature score changes. 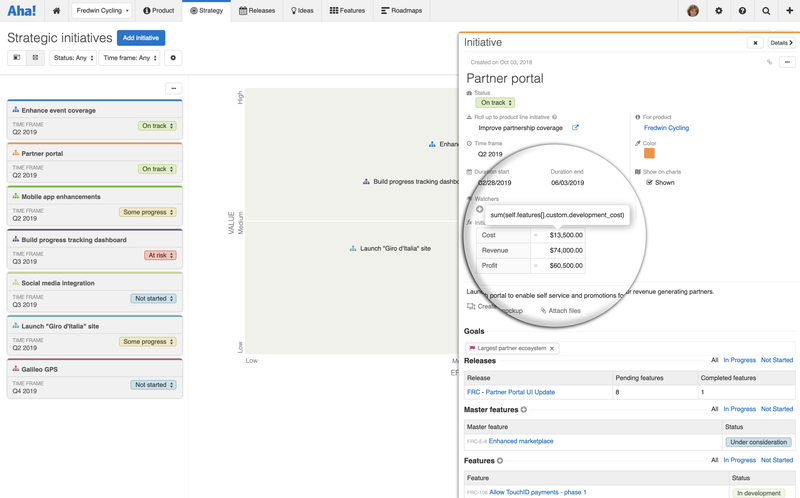 Next, you want to track the overall investment needed for your product initiatives. If you already use Aha! to calculate the cost of each feature, you can create a custom worksheet equation at the initiative level that sums the total cost of all linked features. This helps you project the anticipated spend for your strategic initiatives. You can include all custom worksheet data in reports and charts. 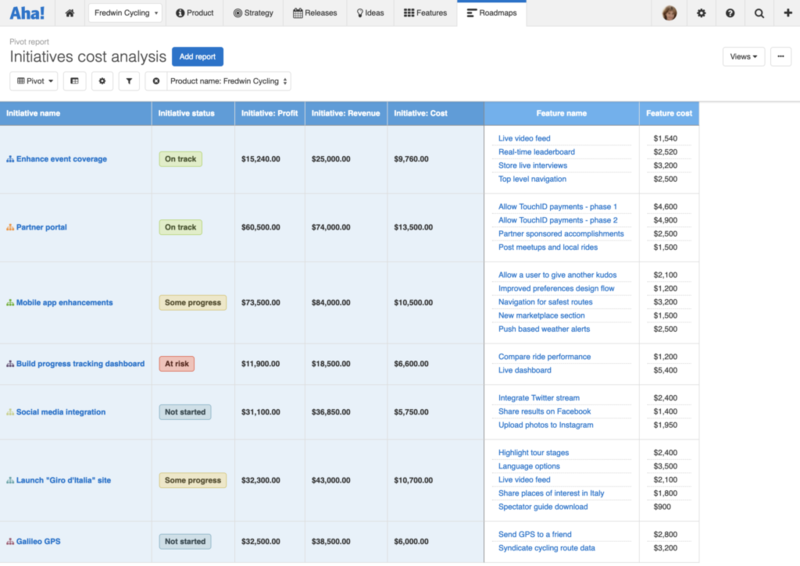 Custom worksheets are a powerful way to analyze your product and marketing planning data. This kind of sophisticated data analysis most benefits large enterprises with complex product portfolios and go-to-market strategies. If your organization would find custom worksheets useful, let us know. We would be glad to help you get started. Custom worksheets are available for Enterprise+ customers. If you are an Enterprise+ customer, we can help you get started using worksheets today. If you are not an Enterprise+ customer and would like to learn more, send a quick note to support@aha.io. A member of our Customer Success team will respond to your request (usually in less than two hours) and share more about the benefits of the Enterprise+ plan.